A while ago I made a Brussels Sprout Slaw that went over pretty well with friends, family, and fans. 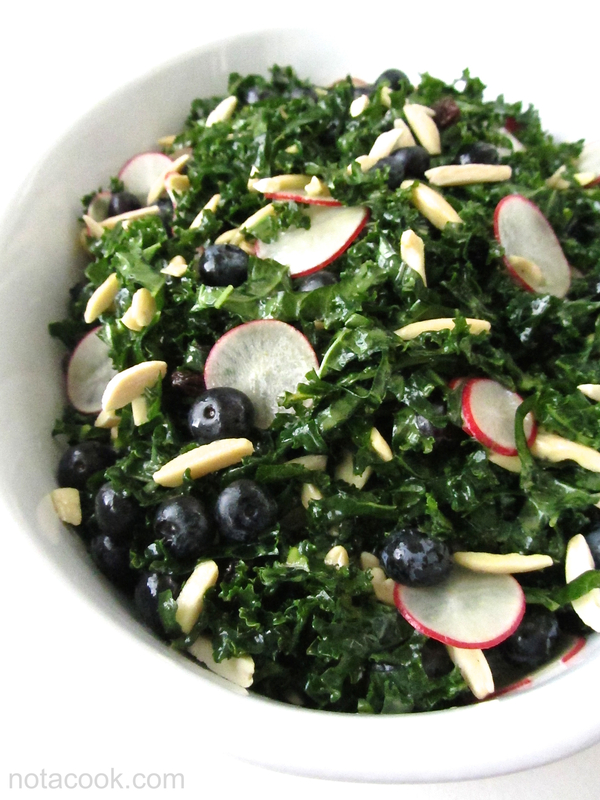 And just to show you how easy it is to tweak recipes, this kale salad is pretty much a cousin to the slaw: all I did was make a few substitutions. The magic of it is that with just a few alterations to the recipe, the salad has been completely changed, with new flavors and textures. So give it a go. Once you get the basics of the recipe down, what will you do to make it your own? 1. Wash the kale, remove and discard the tough stem and ribs, then slice the leaves into 1/4 inch wide ribbons. Transfer to a large mixing bowl. 2. Prepare the dressing. In a small bowl, whisk together the cider vinegar, honey, mustard, lemon juice, and cayenne pepper. While constantly whisking, slowly stream in the extra virgin olive oil and continue to whisk until dressing is emulsified. 3. Pour dressing over the kale ribbons and toss to evenly coat. Set aside and allow to marinate for 30 minutes. 4. Using a mandolin, thinly slice the radishes into the bowl. Add the blueberries and almonds; toss until evenly distributed. Season to taste with salt and pepper. * Vegan version: use maple syrup instead of honey.